What does WATCH do ? E-mail information and discussion on climate change. We then communicate this collective voice to community leaders and decision‑makers by meeting them in person and writing letters, and encouraging others to do so. WATCH also produces WATCHWORD, the highly‑regarded monthly e‑mail newsletter with information on local and national climate change issues, as well as the events and activities of local environment and sustainability community groups. It is circulated to over 800 subscribers across the border region. Find out more about WATCHWORD, and how to subscribe to these free newsletters here. If you want to do something about climate change, you can. There are plenty of opportunities to take positive action, and much important work to do. WATCH has many suggestions and resources on this website, plus some enjoyable social activities. If you care about human‑induced climate change, you are one of us … and so we invite you to join us. 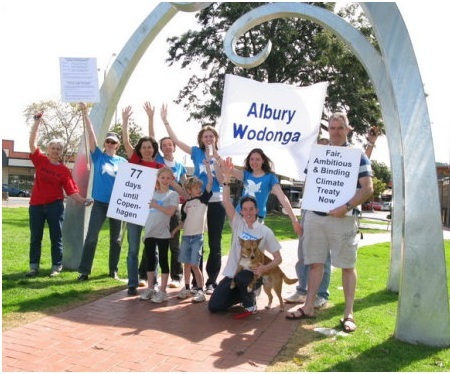 DOWNLOAD: Wodonga and Albury Towards Climate Health – Position Paper. DOWNLOAD: Wodonga & Albury Toward Climate Health — An Interview with Lizette Salmon (podcast).